Power Distribution Component Market size will exceed USD 140 billion by 2025, as reported in the latest study by Global Market Insights, Inc. Growing demand for refurbishment & retrofitting of existing electrical setup along with fiscal & regulatory restructuring across the large-scale industries will boost the global power distribution component market. Lack of reliable and efficient electric network across the emerging nations coupled with industrial inclination towards the advancement of existing electrical infrastructure have positively influenced the industry outlook. Motor control panels have been a prominent breakthrough favoring the power distribution component market dynamics in ways to suit a hoard of applications. These products provide effective insulation for grid infrastructure and are best suited for motor-connected applications to resist vibrational hindrances & variable speed resonance. Distribution components have been largely deployed over the years; however, the ability to sustain across a network with excess fitting accessories provides these products a competitive edge over its counterparts. Fixed mounted power distribution component market has been anticipated to exceed USD 80,000 million by 2025. These units have gained application across high voltage industrial & utility distribution infrastructure owing to robust product build quality and stationary integration. Although, these products find applicability across residential and commercial distribution infrastructure however, the business prospects have primarily been influenced by their adoption across relatively higher voltage electric networks. Vacuum insulation in 2018 valued over 50% of the overall power distribution component market size. High consumer reliability, lesser competitive influence from various auxiliary insulated components, economical price, leakage-free technology and operational reliability have been essential characteristics strengthening the product adoption. Although, the units incur higher initial costs when compared to other available technologies however, consumer inclination and utility preference has supported its installation on account of lower maintenance costs and longer lifecycle. Power distribution component market across the U.S. is predicted to exceed an annual installation of 9,000 ‘000 units by 2025. Increase in demand owing to rising investment towards the expansion of long-distance distribution infrastructure & retrofitting of domestic electric networks have amplified the industry outlook. In 2018, the U.S. Government led proposals to invest USD 10 billion for the development of new electric infrastructure, which is expected to decrease the curtailment rate across the regional grid networks. Electricity demand across the gulf, Africa & APAC regions has pre-dominantly been driven by its ongoing and planned commercial expansions. Henceforth, the demand for distribution components to cater the energy demand across these establishments have distinctly been high when compared to other auxiliary applications. Furthermore, growing focus towards the development of commercial zones coupled with high-end investment flow across the sector will significantly drive the power distribution component market growth. 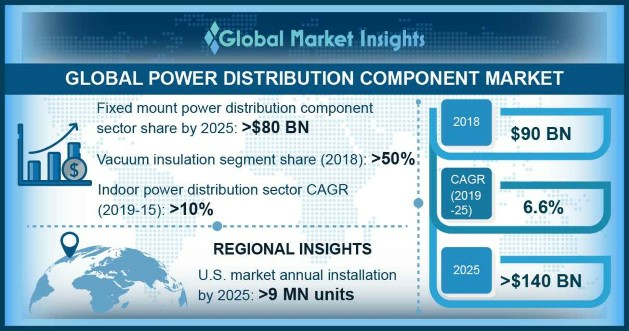 Eminent power distribution component market players include ABB, GE, Eaton, Siemens, Schneider, Hitachi, Hubbell, Powell, Fuji Electric, E+I Engineering, L&T, Lucy Electric, START, Norelco, Al Hassan Engineering, Skema, Rittal, Hyundai, Mitsubishi, Hyosung, and CG.